SOAR (Scholarly Open Access at Rutgers) | SOAR showcases Rutgers scholarship and makes it freely accessible to the world. "Research is more readily available to everyone." 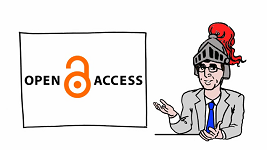 "Thanks so much for providing access to your scholars' papers. I am attempting to understand how other organizations use Google Analytics and this paper proved helpful." "I'm a former pastor of 10 years. I'm no longer active in preaching but still want to read and research. With only a small check to live on free resources are a great benefit. Thank you for this service." "I read the title of this article, which I consider very vital for me, fearing it was another paid article. It was with great relief that I noticed it could be downloaded free. Bravo to OA initiative." "I studied linguistics in college about 10 years ago. It was refreshing to have such easy access to articles such as this one, in order to reinforce and further my learning in linguistics." Bonvin, Alexandre M. J. J. Van den Broeke, M. R.
Getting acquainted with social networks and apps: WhatsApp-ening with mobile instant messaging?